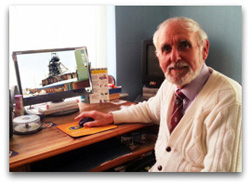 Robert Bradley - Research Work - Are there any historical (or current) shallow workings that extend under our seas? Respect sir.....myself Mr. Jigar Patel and I am working as assistant professor at engineering college, GUJARAT state, INDIA. Now I want to know how detaching safety hook worked during overwind? I also want to know how it is fixed on horizontal member during any overwind? Please give me a detail information about this topic. I also don’t know how this horizontal member is fixed and how many numbers of horizontal members are provided in headframe? Please sir...be helpful and solve my query. Hopefully the drawings below will give you some idea how the safety hook worked. There have been variations on the theme and minor improvements over the years but the principle was the same. 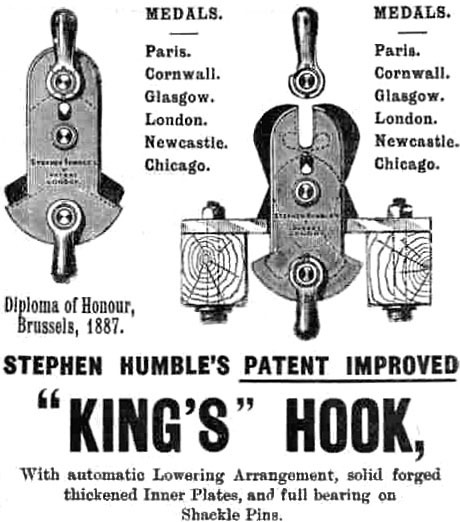 The bell shape on the John King hook was to guide the capel holding the winding rope through the hole in the steel plate vertically and as described below was held by the capel as the rope was released. The hole was slightly bigger than the capel. Later it was a thick metal plate maybe up to 80 mm thick or more held by 2 steel girders anchored to the metal frame of the headgear, instead of solid wooden baulks, with cross girders welded / bolted to form a solid base. The thickness would depend on the ultimate weight to be safely protected such as weight of the cage plus weight of tubs / mine cars of coal or waste dirt, plus weight of rope and maybe a balance rope, or weight of skip with capacity of between 8 tonnes to 30 tonnes etc at the modern or updated mines. Obviously the cage containing men would be lighter. As the capel struck the hole at speed on an overwind the 2 halves of the capel sprang out as a soft metal plug (usually copper) was sheared. The capel when it had gone through the hole then sprang back allowing the 2 halves to rest on the steel plate leaving the cage safely held in the headgear whilst the winding rope was released at the same time, which continued to be wound round the winding engine drum in the engine house, operated by steam or electricity, usually doing much damage as it flailed round and round until the engine was stopped. 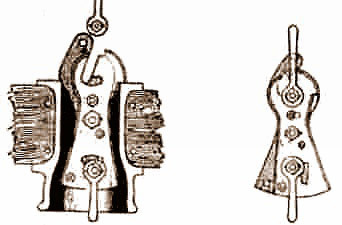 The cage is held safely in the headgear by this device should an over-wind occur, allowing the winding rope to continue being wound by the engine. King’s workshop at Pinxton was turned into a museum in the 1980s, set up and run by Frank Smith a local Electrical Engineer. 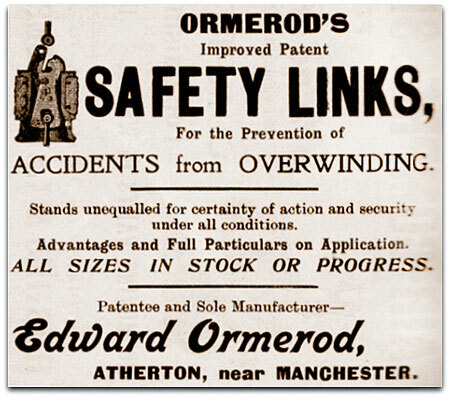 During 1868 another similar device, the Ormerod safety-detaching hook was invented in Lancashire. Both types would become popular and one or the other would eventually be used at almost every mine in the country. See example below of Markham Colliery 1973. 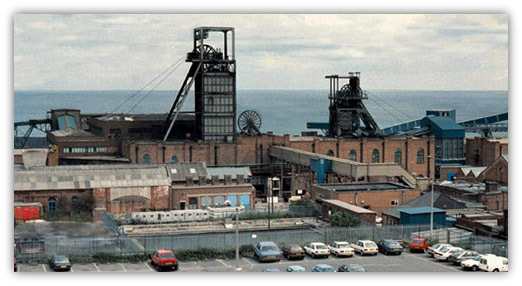 On Monday 30th July 1973 there was a disastrous winding accident at Markham mine (North Derbyshire). At 6.30am the winding engine failed to stop the cage containing a bantle of men at the No3shaft bottom, due to a broken component on the engine, a single-line brake tie rod. The brake mechanism failed on the steam winder and the cage crashed to the bottom of the shaft. RW Keenan the winding engineman had carried out the operation of winding the men into the pit normally when he suddenly saw sparks coming from underneath the brake cylinder followed by a bang. He immediately carried out the operation of trying to retard the engine but to no avail and finally knocked the emergency stop when he realised the engine was not slowing down and also knocked out the hydraulic pump motor, but unfortunately to no avail. The rope from the ascending cage flew off at the King’s patent in the headgear due to the overwind and dropped back onto the detaching hook. The headgear was severely damaged. The cage of riders hurtled down the shaft smashing into the wooden baulks and meanwhile the rope now fell back down the shaft onto and alongside the cage. 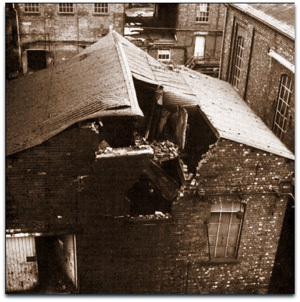 The winding drum continued to rotate and the flailing capel of the underlap rope severely damaged the engine house and an adjoining workshop. 18 men were killed and 11 were seriously injured, with 13 men being killed outright and a further 5 dying of their injuries. 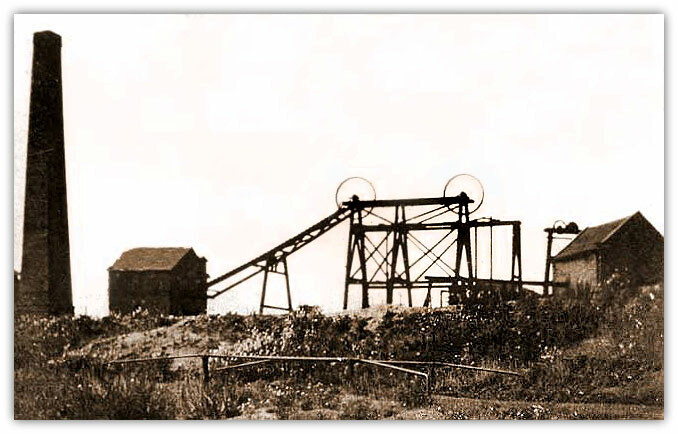 The automation of winding engines continued following this accident.The 15 feet (4.57m) diameter shaft had been sunk in 1886 to 1,626 feet (496m) deep but the bottom 189 feet (58m) had been filled to the Ell seam horizon pit bottom at 1,407 feet (429m) deep. 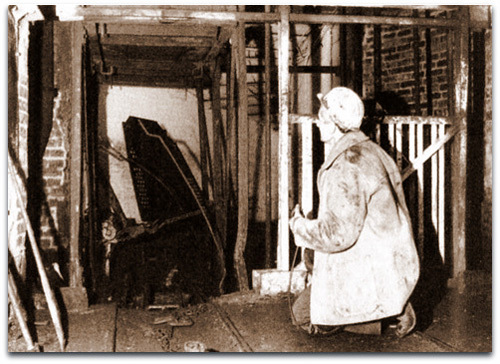 A kibble for 2 men was lowered down the shaft using the emergency winding engine in order to inspect the damage. It was about a week before the damaged cage could be raised to the surface. Much investigation was carried out by NCB engineers and HM Inspectors. 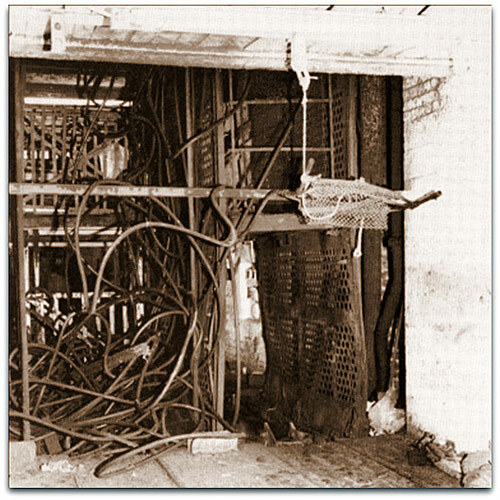 A later idea was installed at many of our mines in the late 1980s / 1990s called Bennett catch gear, where again an overwind caused the cage to be wound into the headgear at speed and was caught by a series of catches as the rope was released. Also pit bottom sump buffers were installed to cushion any cage failing to stop in the pit bottom. Unfortunately the last 3 deep coal mines were closed in Britain in 2015 bringing to an end about 1,000 years of mining. Although burning of coal will continue at our power stations until being phased out in 2025 by European directive, it is cheaper to import coal from countries such as Columbia, Australia and South Africa etc. Trusting this will be sufficient information for your needs. I have been trying to access Ian’s website (CMHRC) but with no success. Do you know whether the site still exists? I am specifically trying to locate the 1842 Royal Commission reports. 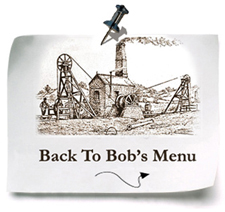 There is some information about the 1842 Royal Commission reports in Bob's pages. I have a couple of PDFs which I will forward. Research Work - Are there any historical (or current) shallow workings that extend under our seas? I am researching material for a novel and I would be delighted if you could help me with a coastal coal mining question. Are there any historical (or current) shallow workings that extend under our seas? Coincidence or what? Where is your family from? Anyway to answer your question....yes indeed there were workings under the North sea from mines in the North East such as Lynemouth merged with Ellington in 1983. There were several other mines very close the coast that also had workings under the sea. Ellington the last mine in Northumberland and the NE Coalfield closed at end of 1994 by British Coal, re-opened by RJB Mining in 1995 but closed in February 2005 by UK Coal following an inrush of water in a development heading that swamped the workings and the pumps could not cope, Although the workings stretched for up to 6 miles under the North sea from the shore the inrush was not sea water but from flooded old workings above. It is known that the coal seams do pass under the North sea onto the Continent as proven by borings from boring rig platforms searching for coal and oil. There were about a dozen North East Collieries working beneath the North Sea in Northumberland and Durham. If you require the figures in metres multiply the feet values by 0.3048.